- Found in houses, offices, shops, etc. Being a noteworthy enterprise of this industry, we are offering a wide spectrum of Keepsake Heart With Box. We provide a unique range of blue pottery heart style box which is manufactured using superior grade of raw material. These are available in various colors and models. We do international quality packaging of these blue pottery heart style boxes as to deliver safely at the client’s end. We export these blue pottery heart style boxes in various parts of the world at affordable prices. Our elegant heart shape container is another great choice. This is ideal for gifting candies and chocolates to beloved ones. These are offered in printed and plain forms. 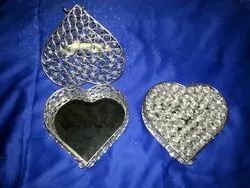 We are offering a wide range of Hearty Jewellery Box. Papier Mache Floral Heart Shaped Box. 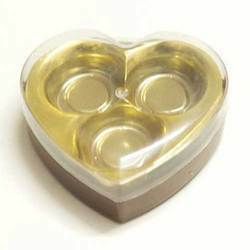 Heart Shapes Box 330 Ml 58 mm height width 100 mm ps. cleared. When have chocolates ever been a bad idea as a gift Never! This Heart-shaped box of 10 assorted chocolates contains all the delicious and most loved flavours that can be combined with chocolate. We are the manufacturer of Fancy Jewellery Box of different sizes. Box Heart made by crystal. It is hand made product and it is mainly use for putting jewellery. We Are Manufacturer of all Types of Sweet Box, Fancy Box, Duplex Box Packing, Our All Over Experience Of 40 Years In This Field. We are engaged in offering Heart Shaped Paper Boxes, which are made using premium quality paper and are available with us in various sizes, designs and shapes. These are designed as per the set industry norms and standards and can be bought at market leading. These heart boxes are widely acclaimed by our customers for appealing color, eco friendly, attractive design and unique look.